The 2017 AFL New Zealand Youth Competition has drawn to a close after a successful final round in both Auckland and Wellington over the weekend. The competition commenced in October and has been a huge success in introducing the game of AFL to new boys and girls in both regions. 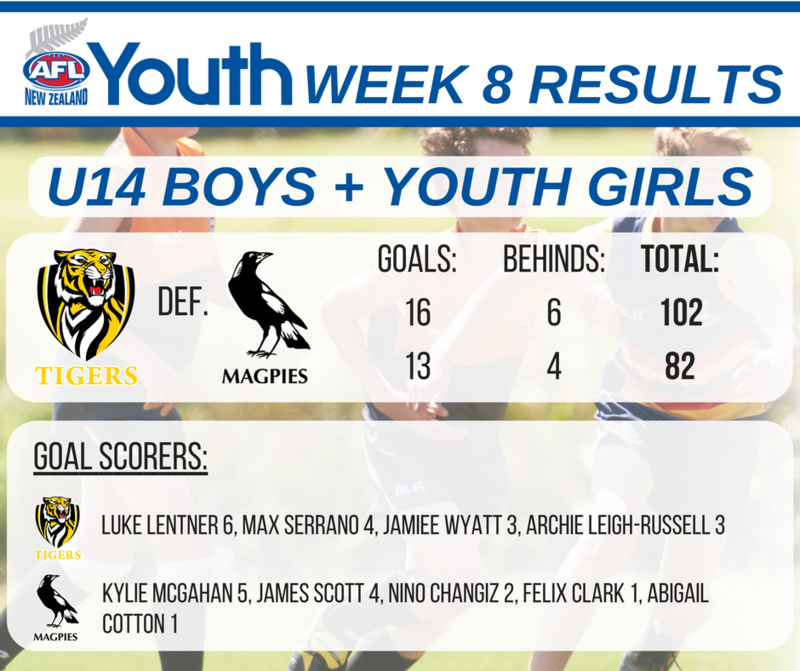 The Tigers won the battle against the Magpies for the final time in 2017 as they were victorious by 20 points at QBE Stadium. Luke Lentner and Max Serrano capped of their successful seasons by kicking six and four goals respectively. Kyle McGahan was the Magpies best player and in her debut season, was named best and fairest alongside Killarney Morey in the youth girls competition. 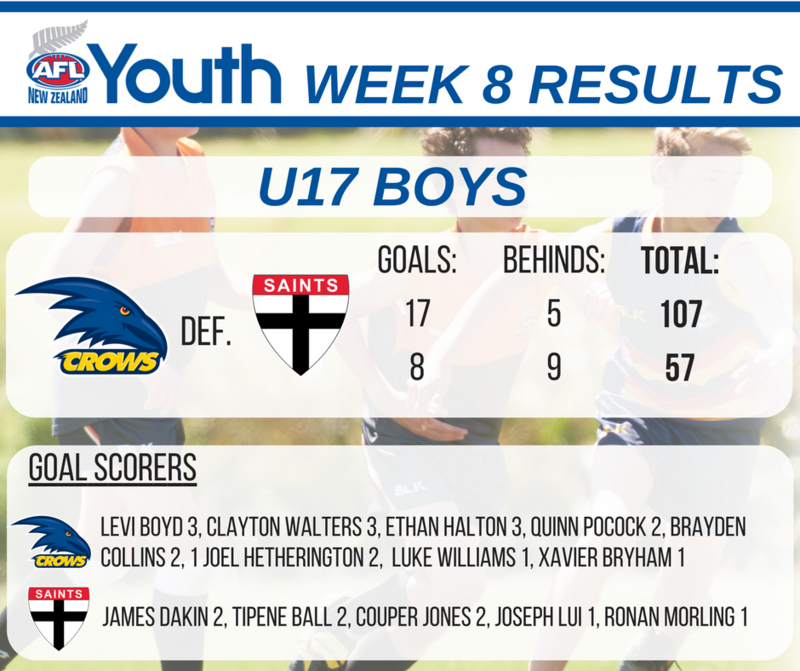 In the U17’s, the Crows ran out 50 point winners as player of the day Luke Williams performed well in the middle of the ground and combined nicely with forward Levi Boyd. For the Saints, Bradly Munro and James Dakin were executing their skills well as Munro was named player of the day. It was a high paced game in warm conditions at Hutt Park in Wellington and the difference between the sides was the Lions accuracy with Joseph Cole kicking four goals no behinds. Maddie Christians had a great game first up for the Saints feeding handballs out to running players through the middle of the ground. 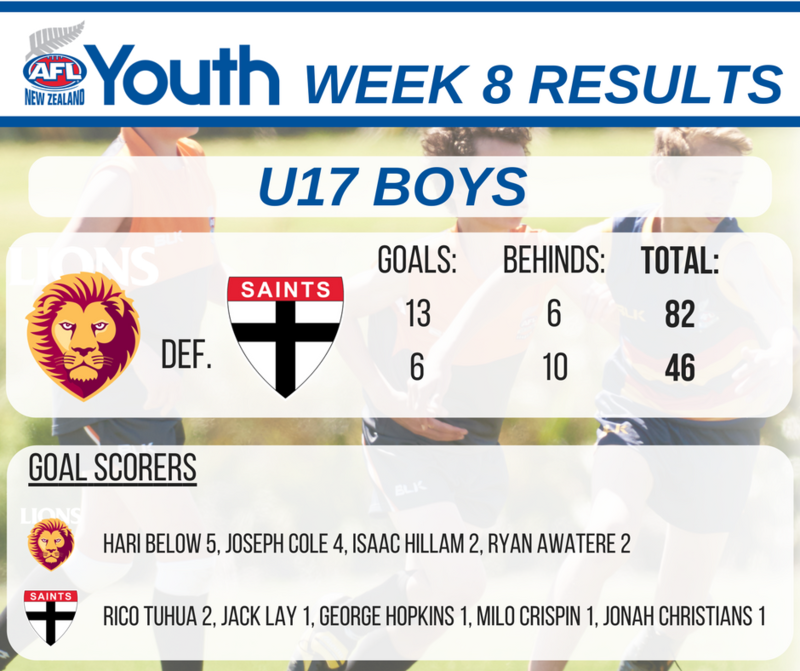 Isaac Hilliam provided his usual strong rebounding game for the Lions and Hari Below converted well with some long distance goals. Rico Tuhua for the Saints and Bailee Laurenson for the Lions the had an absorbing battle as competing Rucks and both played good games working hard around the ground. Over the course of the competition coaches have been voting for their Best and Fairest players each week and the winners were announced during the presentations. AFL New Zealand would like to thank everyone involved in the 2017 Youth competition. To all the players, parents, volunteers and umpires, we couldn’t have done it without you and look forward to bringing you a bigger and better competition when it all starts again in October 2018.